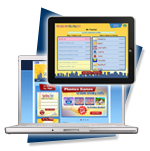 Teachers, parents and homeschoolers appreciate the time-savings and convenience of using VocabularySpellingCity. Students have so much fun, they don’t even realize they’re learning! Word study doesn’t have to be boring. Students can learn to spell while helping a mouse sneak a piece of cheese, quiz themselves in a game show hosted by a penguin, complete a crossword puzzle, or take a practice test on VocabularySpellingCity. More than 35 activities offer immediate feedback, motivating students to keep studying while reinforcing correct answers. VocabularySpellingCity automatically grades spelling and vocabulary tests. Teachers, the ability to create custom content, coupled with VocabularySpellingCity’s automated record-keeping naturally lends itself to differentiated instruction. Assignments can be created for individuals, small groups, or the entire class. Review Lists can be created to target your students’ instructional needs. Progress monitoring tools help guide instruction. Parents, are you spending endless hours every week practicing spelling and vocabulary words? With VocabularySpellingCity, your child can direct his own learning! Your child can input any word list for use in any activity. Practice tests help quickly identify words that need more study time. Homeschoolers, are you looking for more time in your day? Track progress and time on task. Access automated reports to include in your portfolio. Create your own lists, or select from thousands of word lists organized by subject and grade level. Game-based learning with a school-home connection! Access student activities on the web or on the go using our app! Students can extend their learning time both inside and outside of the classroom using VocabularySpellingCity. Students access their teachers’ lists and assignments from any device: computers, Chromebooks, iPads, iPhones and Android phones. Implementation is easy at schools with 1:1 learning environments. VocabularySpellingCity is also used effectively in classrooms with interactive whiteboards.